Spotted salamanders, Ambystoma maculatum from Blue Hills Reservation, MA. 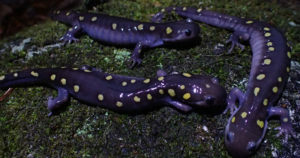 A deadly fungus has been spreading throughout the salamander population around the globe, vexing conservationists and pet owners alike.The chytrid fungus has spread from Asia to the Netherlands and Germany through the pet trade, and could reach North America the same way. Scientists fear that it will kill off rare salamanders in the wild, posing a major risk to the biodiversity of salamander populations in North America. In a study published recently in Trends in Microbiology, UMass Boston Biology Professor Doug Woodhams has uncovered a method that might help save species of salamanders and frogs from the fungus – using good bacteria to help salamanders fight off chytrid fungal infection…by Anna Fisher-Pinkert.